Receive updates, create incidents and post replies automatically through email. Save time where you can. If you’ve got a never-ending support queue, any amount of time saved can help stem the tide. 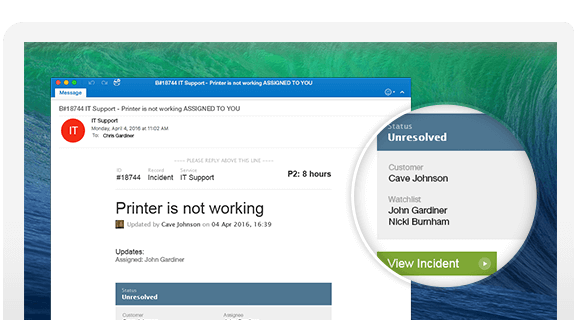 Service Desk allows your technicians to react to notifications through email, instantly converting messages into new incidents or comments. It’s a simple shortcut that your team will quickly come to appreciate. Each service you manage in Service Desk comes with its own support email address. When your technicians and users send a message to this address, Service Desk takes care of the rest. The email’s content becomes the basis of the new incident, and the sender is notified that things are underway. Technicians can also add new comments by replying to email notifications from the incident. The online customer portal is a great resource for submitting incidents, finding articles and viewing messages, but it’s hard to beat the ease of email sometimes. 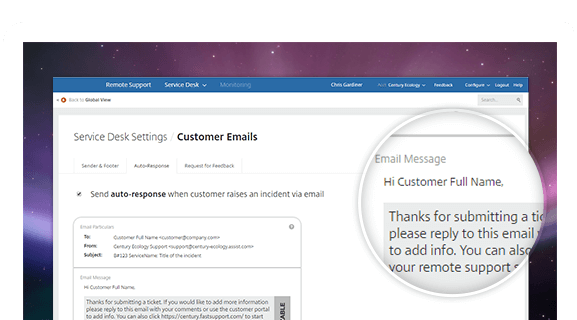 If your customers prefer to ask for help in email, Service Desk can step in for you. Customers get to stick with what they’re used to, and you don’t have to waste effort entering incidents for them. Does your organization have a unique email address for support already? Not a problem. Just set up a new rule in your email client to automatically forward incoming messages to the right Service Desk support address. This will trigger the creation of an incident the same way. Store contact details and give your team a customer-centric view of incidents. Integrate Service Desk with your business systems for extra efficiency.